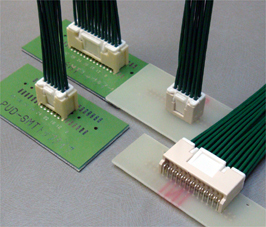 This is a board-to-wire connector with secure locking device that has been designed to 2.0mm pitch, crimping style and double-row. In spite of realizing low insertion force, the stable electric connection is demonstrated against the condition such as vibration, pinching and dry circuit. It is possible to unfasten the locking even if the header is surrounded with a case wall within height of header because the tip of locking device in receptacle does not protrude from its area.